Two years ago, I gloriously birthed a beautiful baby boy in a peaceful setting in the Australian bush, surrounded by friends and our children and those we like to call family. Elijah was healthy and happy and lived a life brimming with love. 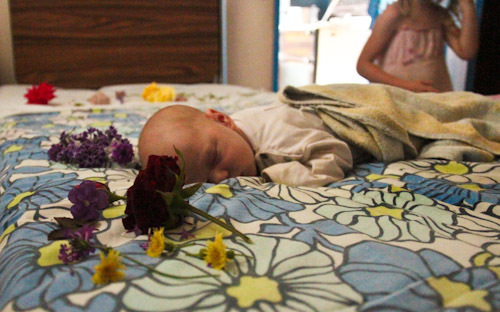 Still a newborn, Elijah sleeps peacefully in a bed of flowers, carefully chosen and arranged by his three big sisters. 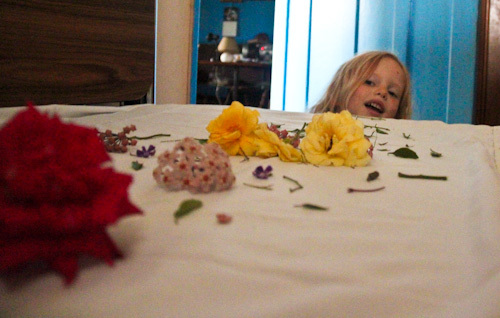 Brioni looks over her horizontal floral arrangement. Before he was seven months old, Elijah drowned. He was loved and then he was gone. Dead. You may not know it to look at me, but I still have a son. I’m followed around by a passel of little girls and fend off almost-daily remarks about our family. Oh yes, I did. I did want a boy. And I received him — my precious Elijah who remained close to my heart even outside the womb. But what can I say in response to a stranger’s clumsy small-talk? I watch friends’ sons of similar ages. They’re starting to talk through chubby cheeks and food-stained mouths. And I’m glad that others still have their sons to cuddle. So each night I snuggle in closer to my four precious daughters, thankful that they are each still by my side. For I have experienced the fragility of life and know that no outcome is guaranteed. But meanwhile, I live with a son who has grown invisible to almost everyone — except me. He’s two today. Happy birthday, Elijah.